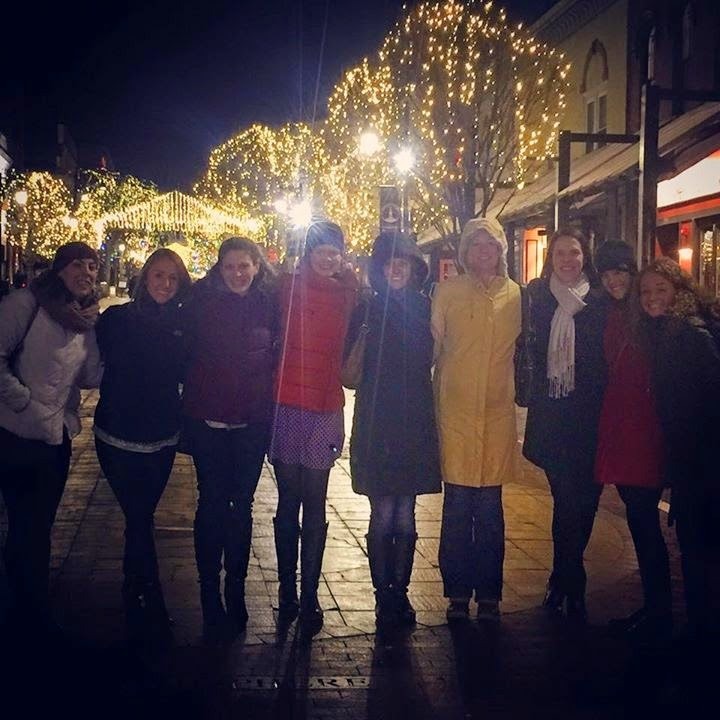 Last weekend we traveled to Burlington, Vermont for Emily's Bachelorette Weekend! It was filled with many highs and some lows. . . I'm able to share most of the photos with you! Friday morning 4 of us met up at Emily's apartment to carpool and we picked up one more on the way out of Boston. We made it all of twenty minutes when the car started acting up. Several lights came on and we got off the next exit and made it to a gas station. Thankfully they had a garage and they guy said "well it is either your battery or alternator and the goods news is we can fix both for you today and get you on the road." Well he was right it was the alternator. Four hours later the car was fixed and we were on our way. Not pictured: playing heads up in the gas station waiting room while freezing. 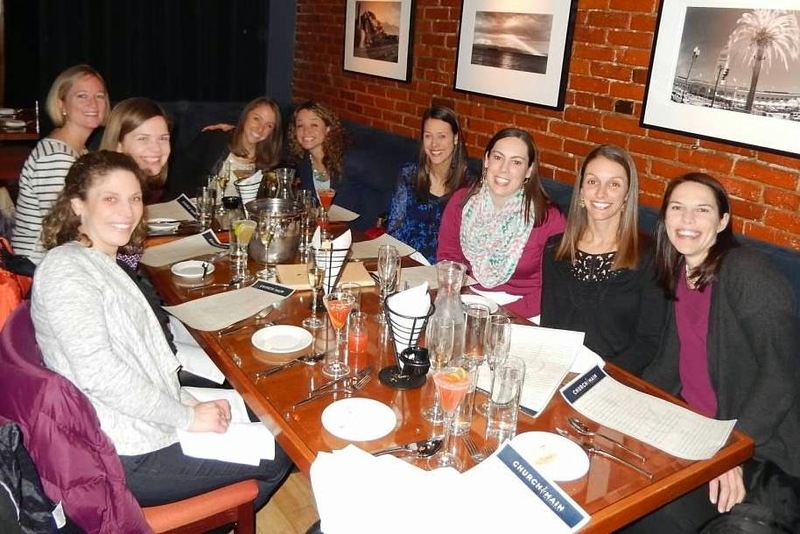 The good news is everyone made it to Vermont and we thoroughly enjoyed some drinks at dinner at Church and Main! One of the bridesmaids who couldn't make it sent a bottle of champagne to Emily which was so thoughtful! My chicken was good but not fabulous for the price. The drinks on the other hand were delicious so I guess that evened things out! After dinner we posed for a quick photo on Church Street. prior to going back to the hotel. Not pictured: playing Cards Against Humanity while drinking wine and eating chocolate! Saturday we spent the majority of the day at Jivana Holistic Spa. 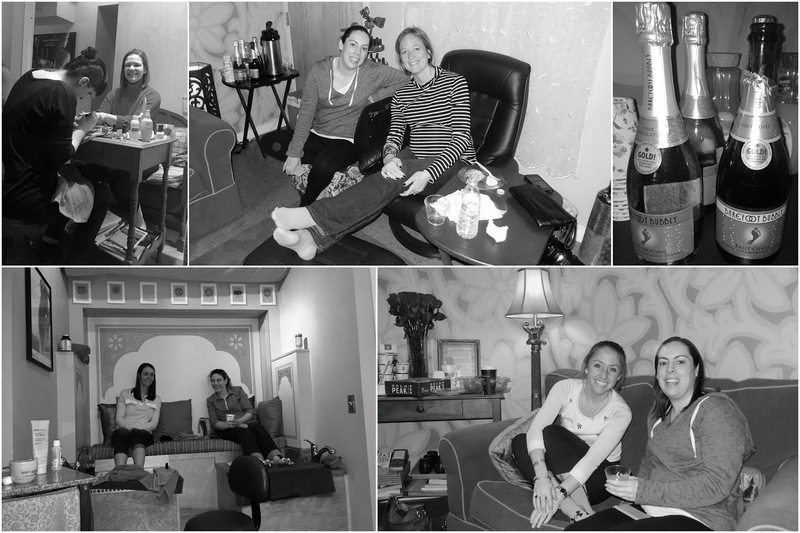 They actually closed the spa for us and we took over the relaxation room. We took turns getting treatments and I had an amazing hot stone massage that was so relaxing and soothed my sore muscles from all of the shoveling! Church Street is so cute! It is a pedestrian street filled with cute shops and restaurants. Unfortunately we didn't have time to shop but just a good excuse to go back in the future. 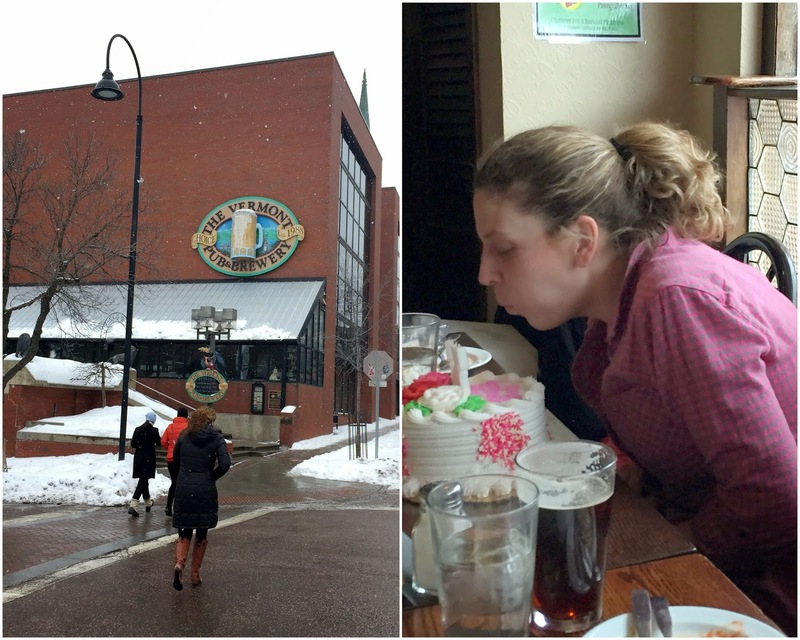 Saturday also happened to be Beth's birthday so after the spa we went to the Vermont Pub and Brewery for drinks, apps and birthday cake! 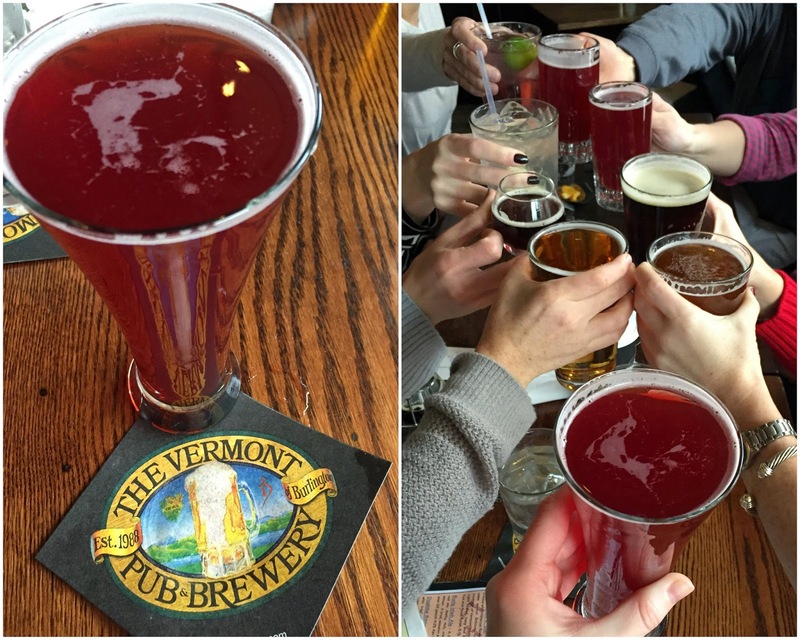 You can't tell from the photo below but I had a raspberry beer that was dark pink! That was a first for me. It was pretty good. We all clean up nicely don't we!? We went to Duino! (Duende) for dinner which is known for their "street food international" menu and OMG it was SO good. And cheap! Highly recommend if you are ever in Burlington. I had these amazing tacos with pineapple salsa that were amazing (see photo below). After dinner we ventured back down Church Street to make our way to a bar for more drinks. We looked pretty cute all bundled up! It snowed ALL weekend. It was always coming down but never seemed to accumulate to much. There were ice sculptures on display on Church Street and some of them were interactive. I was way too cold to take my hands out of my pockets to play along! Nicole (middle) is the Maid of Honor and just so happened to be 30 weeks pregnant with twin girls at this point! She was such a trooper all weekend and planned such a FABULOUS bachelorette party. We had drinks at the Farm House. When we heard there was a fireplace there so we were sold. By some miracle we scored seats right around the fireplace and it was so warm and cozy. It was the perfect place to warm up before our next stop. Our last stop for the night was at Ri Ra Irish Pub. We actually use to have one of these in Boston so we were pretty excited when we saw it. It wasn't planned but it ended up to be the perfect bar to spend the rest of the night. There was an Irish band planning and the crowd was laid back and fun. We had a blast as you will see from the photos. . .
Emily may have gone on stage. . . more than once. The best was when she was invited up to sing along with "Wild Rover" but didn't know all the words so got some moral support from Cathy! Then this happened. Just kidding. Like I would really do all those shots! I hadn't done a shot in years but did participate for this special occasion. Later I went to sit down for a few minutes and all are glasses were still there so I was joking around and someone snapped this photo! Haha! And then I decided I better not share anymore photos from Saturday night. We made it back to the hotel and crashed! Not pictured: everything! We packed up and got on the road early because it was snowing in VT and we were getting a big storm in Boston (big surprise). Unfortunately our ride home was not great. The roads were slippery which was not fun. Oh and then we stopped at a gas station for snacks and I proceeded to eat an entire bag of cheese curls. Then I decided to read an article about Kelsey from The Bachleor on my iPhone. BAD IDEA! I got motion sick and well you can figure out the rest. Sitting in the back seat has never been great for me. Luckily once I got sick I felt much better and just made sure not to look at my phone for the rest of the ride. We finally made it back to Boston and I had to shovel out my car at Emily's and then shovel out my space when I got back to my apartment. It had snowed twice while we were gone. The bad news was a big storm was coming on Sunday night into Monday - the good news was that meant I stayed home from work and had a day to relax! (Honestly I would have rather had no snow and gone to work. I'm so sick of all the snow). It was all in all a wonderful weekend. 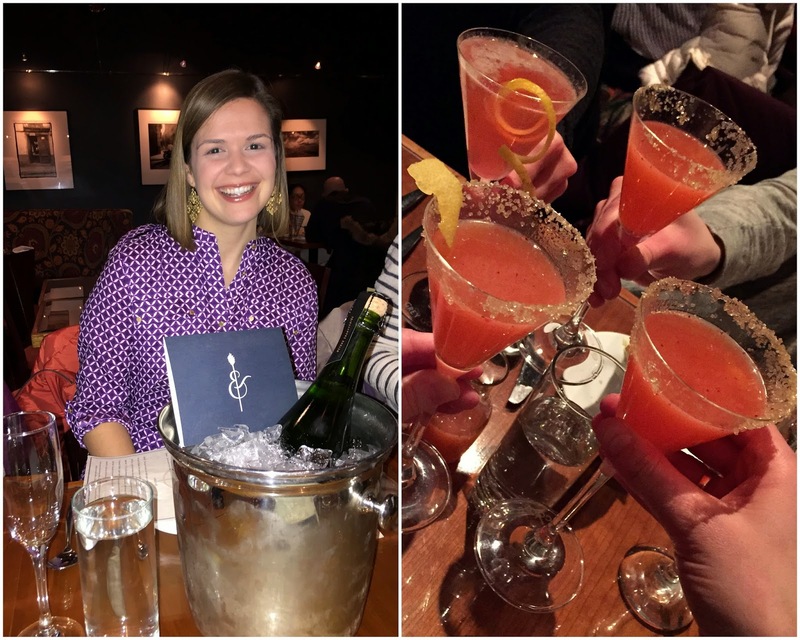 It was so much fun to celebrate with Emily and I can't wait for her wedding which is just over 2 months away! Wow, that was quite a weekend! 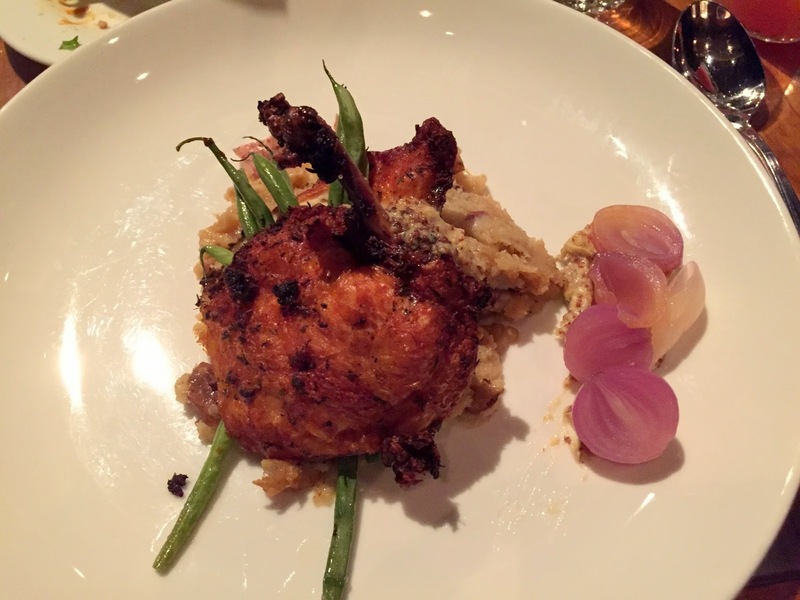 Looks like good eats, good drink and good times were had by all! The interactive ice sculpture thing is pretty cool! Shoveling was the highlight of our Sunday as well! Haha! 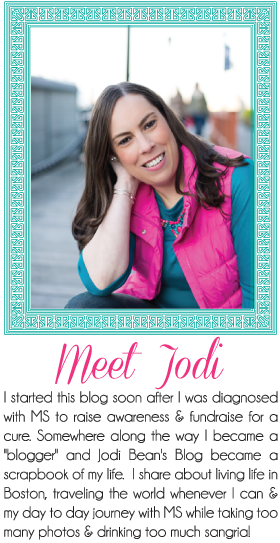 Found you through the link up! 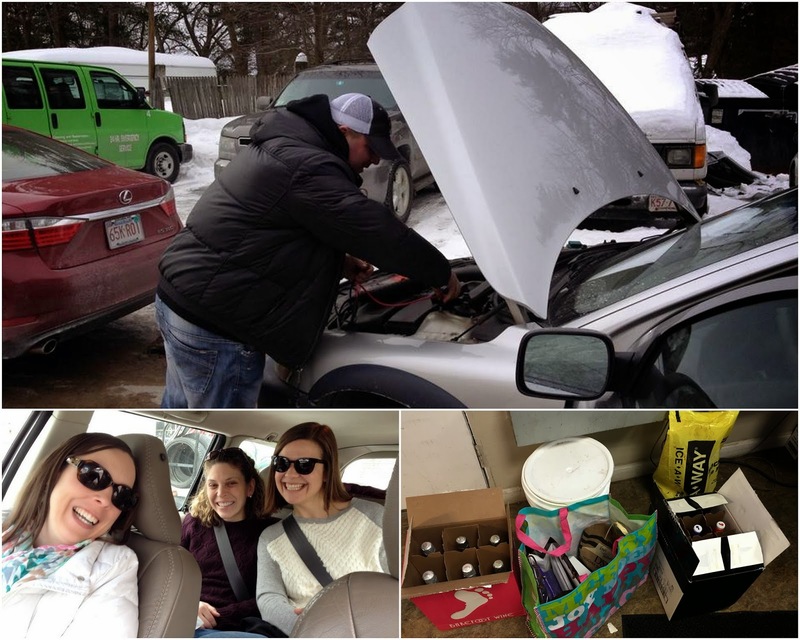 Aside from the car trouble looks like you all had a great time! Looks like a fabulous weekend despite the car trouble. And all those drinks look delish! What a great weekend! It looks like you all had a blast! What a fun weekend! Church Street looks adorable! I want to go. I get car sick too, it's the worst! I'm glad it didn't last the whole drive for you though. That looks like a totally amazing weekend!